The Marine Breeding Initiative’s 2012 workshop is next weekend, so the timing to share a pic of a captive breeding success story. Metasepia spp have long been thought of as one of the ultimate aquarium display animals. 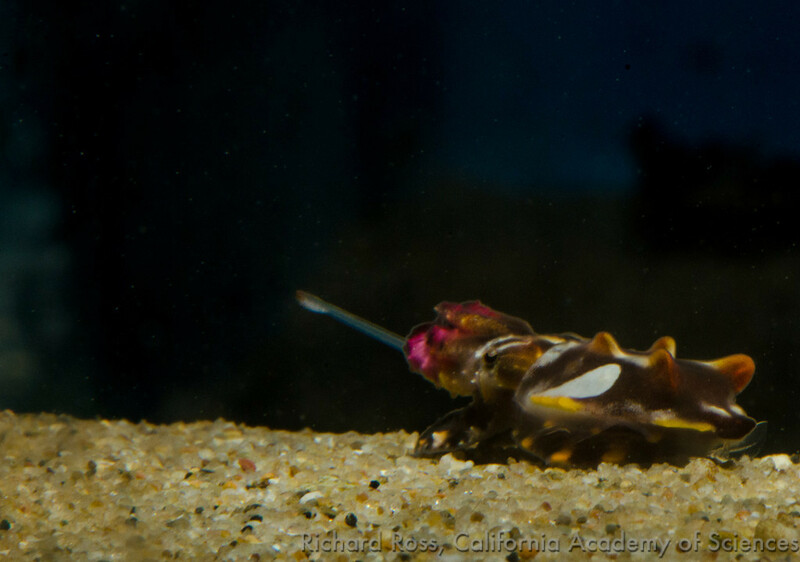 Their colors and patterns that continually change and move across their skin make their common name obvious – the Flamboyant Cuttle. The problem? The only live about a year, and they have traditionally shipped poorly which means if you are lucky enough to get one that survived shipping, its probably near the end of its natural lifespan anyway. Captive breeding would be a no brainer, except getting broomstick has been near impossible because on the rear occasions these animals do get imported, the get imported in single digits. That changed several years ago when a shipment of about a dozen animals came through and were distributed to ceph heads at 2 public aquariums. Those animals were successfully bred, shared with other public aquariums and now we are several generations of captive bred animals at several institutions. Without captive breeding, these animals would have only been a flash in the pan display, but due to the dedication of aquarists and the commitment to captive breeding on the part of public aquariums, we are well on our way to establishing a potentially stable captive bred population. Captive breeding is fun, educational, beautiful, and holds the potential for anyone involved to make cutting edge breakthroughs and observations – 4 really good reasons to give it a try yourself.